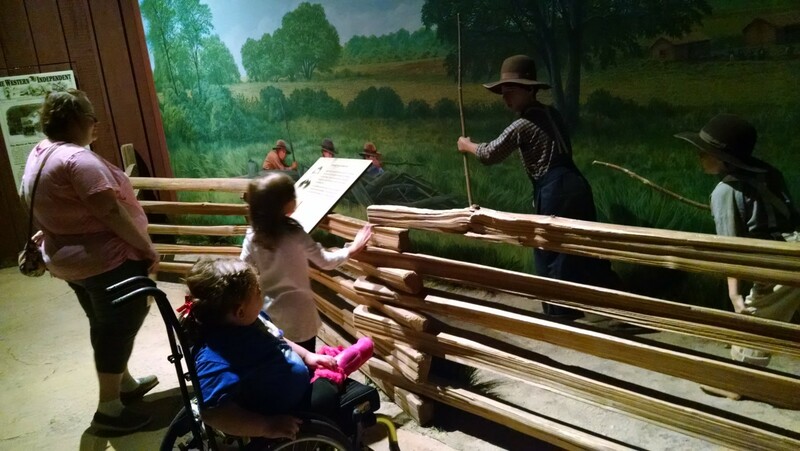 We’ve taken Namine to the Kenosha Public Museum before, but she’d never been to the dinosaur or Civil War museums. 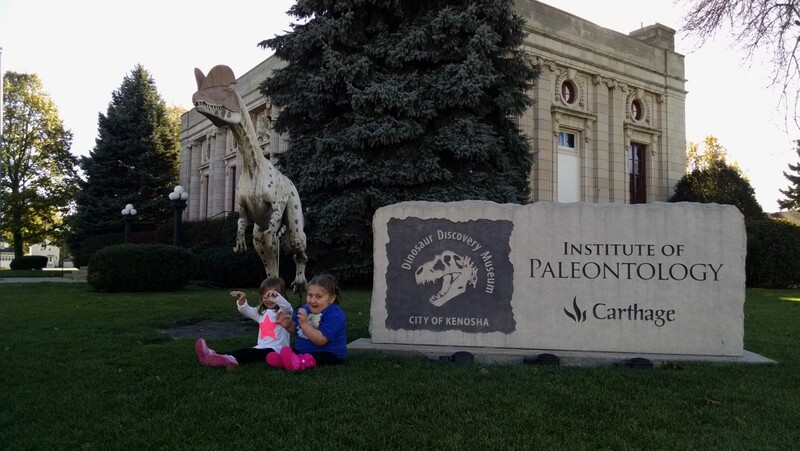 Given the choice, the girls picked the dinosaur museum as the first stop. Aside from the general exhibits, there was also a children’s area which contained a dino dig. Unlike the excavation area at the Betty Brinn museum, Namine couldn’t reach this from the floor. Sitting in her wheelchair, she had to lean over quite a bit, but she made it work. Before we left the dinosaur museum, the girls posed for some pictures by the Dilophosaurus statue out front. 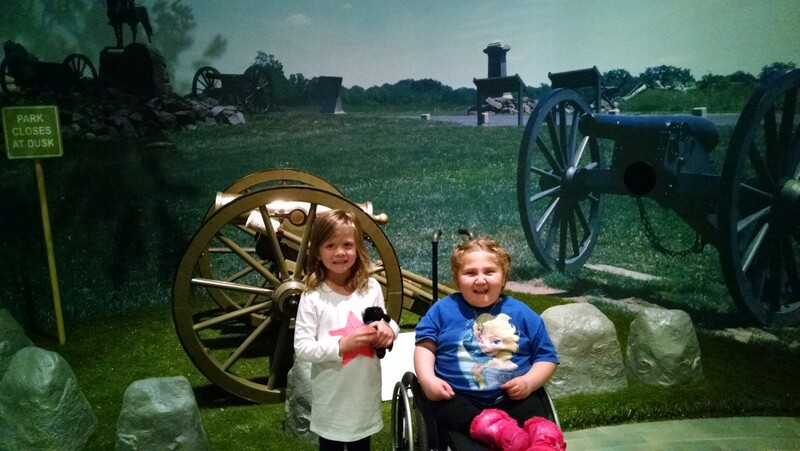 We visited the Civil War museum next. If Namine has a least favorite subject in school, it’s history. She’s much like me in this regard; I never had a head for dates, and I could not care less about what happened so long ago. Fortunately for me — being married to a history buff — that is no longer true. But it took me well into my adult life to realize that history is not only worth learning, it is fascinating. Jessica and I want to do all we can now, to instill in Namine an interest in history. Namine is a visual learner — again, much like Jessica and myself — so a museum seems to us the best place to go. Much of the museum is a bit old for Namine, to be honest. (If we can ever make a day of it, Jessica and I would love to come back, just the two of us.) Even so, Namine’s interest was held for the majority of our time there. Namine’s interest was not so much in the larger events — the battles, the speeches, things like that. Rather, it was in the seemingly ordinary: the stories of people, regular people trying to do the right thing. People standing up for what they believed in. The notion that these were people, people just like us, hadn’t crossed her mind. Up until then, history was more nebulous, just something in school that she had to learn. Discovering that it was more than that brought a light to her eyes that I loved to see. The last visit of the day was to the Kenosha public museum. The day had been long, and both girls were tired and a little punchy (but not punching each other, thank goodness). So we made our way through the prehistoric section — Namine’s favorite — to see the woolly mammoths. When Namine discovered that the meat we eat comes from living animals, she wasn’t bothered a bit. She was fascinated, though. 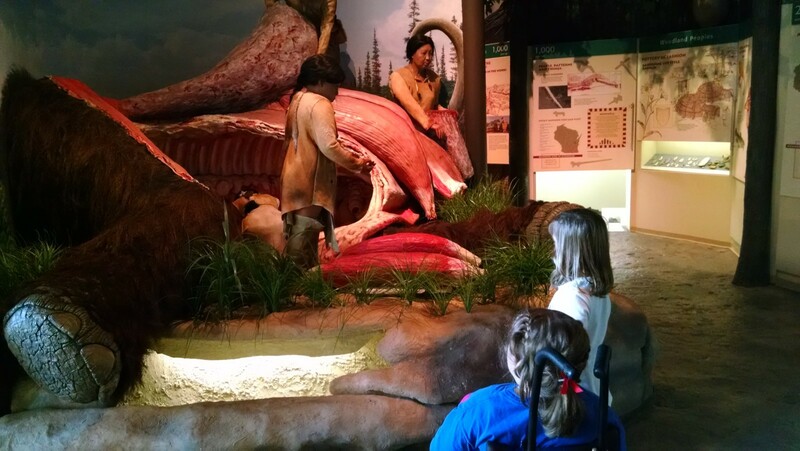 Similarly, she finds it interesting that in one of the exhibits, the mammoth is shown in the process of being carved up to feed people.